HoofPrints own Horse Woman design is intricately appliqued tooled leather-look fabric with satin stitch embroidery. Sizing is unisex - runs generous - please check the size chart to make sure you're getting a perfect fit. Here's one of my favorites. This chocolatey brown sweatshirt was YEARS in the making... A few years ago, while shopping for nothing in particular, I happened upon some fabric that looked like tooled leather. It was expensive, but I bought a whole bolt of it - intending to use it on a shirt design that I had on the drawing board at the time. When the sample was made of that design, it looked terrible. No amount of tweaking improved it, either; much to the chagrin of my embroiderer, who endured my multiple requests to change thread colors and make new prototype sew-outs, etc. Everywhere I looked, I saw this elegant brown floral leather pattern. Still - nothing worked out design wise for the shirt and it was driving my crazy. Here I had this perfectly western, beautiful fabric - and I could NOT seem to make it into an attractive design no matter how hard I tried. This dragged on for two YEARS! 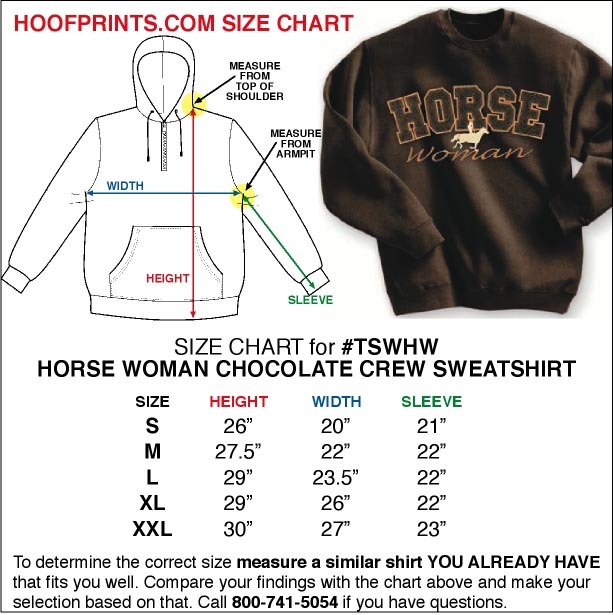 Then, we got a sample sweatshirt in - in this nice dark brown - intending to market it to men. Something made me revisit the forgotten fabric, and this time it was a winner! After that, the designing was easy. It's funny how things fall into place easily when the time is right... I was able to find a company in southern Indiana that specializes in precision cutting fabric using high-pressure jets of water. As luck would have it, the customer service rep who handles my orders is also a horse woman - and she took special care to make sure our H-O-R-S-E letters were cut just right. 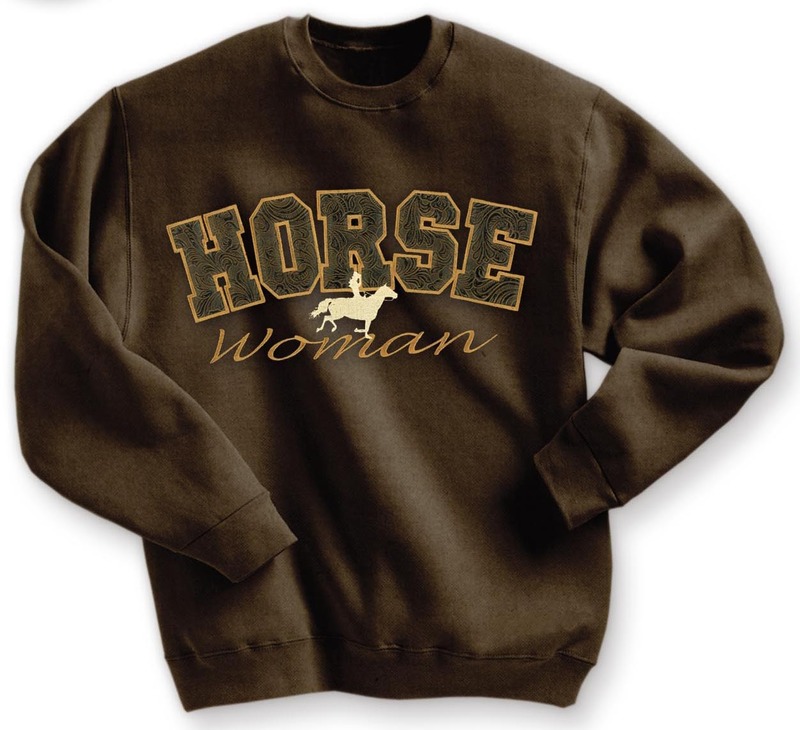 Then the fabric letters come back here to Central Indiana to be carefully stitched onto this lovely brown sweatshirt, complete with the silhouette of a woman and her cantering horse. Whew! I think it was worth the wait.